Pooh's best friend is back and even though he may be small, he has a huge heart! 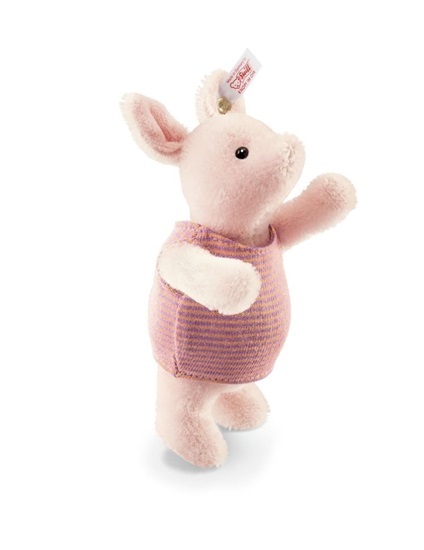 We are pleased to offer Piglet from the Worldwide Limited Edition of 2000 handmade in Germany by Steiff. Piglet may be small, but his heart is huge. He is from the Winnie The Pooh Series and is Pooh's best friend. He is sewn from genuine pink mohair with hand-stitched details, including his purple and orange striped sleeveless shirt and black safety eyes. He is 1-way jointed and stands 5-inches tall. Piglet has a white tag, with a gold-plated "button in ear". He is surface washable with no sound device.